BEDUC391 (2015) - Daniel Novak, Ph.D. The world of educational technology is constantly changing. It is an area of research that has exemplified some of greatest hopes for the future of education, and seen some terrific failures in practice and implementation. However, in a surprising twist, educational technology has recently emerged as a powerful commercial industry, with hundreds of new hardware, software, and systems solutions appearing on the market each year. To complicate matters, these markets are susceptible to hype-cycles that can cause educational leaders to over invest in unproven technologies for learning. The confluence of powerful market forces, Moore’s Law, consumer technology access, and corporate hype can have substantial impacts on teaching and learning in educational settings from pre-school to the workplace. As a teacher or teacher-to-be, it is essential that you have an understanding of the constraints and capacities of educational technology tools to improve particular kinds of learning in particular kinds of ways. This knowledge will help you to make informed decisions about integrating technologies into your teaching and professional development as new tools show up in your classrooms. To help you on your way, this course will provide you with three kinds of learning experiences. First, you will learn about how new technologies impact the teaching and learning process through classroom lectures, discussions, and critiques. Second, you will learn about the limitations and powers of these tools through a hands-on process of creating technology-enriched website for others to use. Third, you will learn how to evaluate the specific properties of these technologies to determine if they can live up to their expressed claims. With these three skills, you will be well positioned to make smart technology choices for your classrooms throughout the 21st Century. How might we most effectively use technology to improve teaching and learning at different points across the lifespan? What is the role of instructional design in designing effective learning experiences with educational technologies? What are the ‘effects’ of using digital technologies on teaching and learning? How has technology been used in education historically, and how have these uses changed over time? In what ways are technologies transforming teaching and learning in K-12 knowledge domains like literacy, numeracy, and science? How are technologies exerting changes in learning outside of the K-12 classroom? Using the provided form, you will begin to design a realistic piece of instruction using what we have learned from the first week of class. You may choose any audience, behavior, condition, degree, and evaluation method, but your choices must accurately reflect the learning needs of a real group of people. With your ABCDEs from the Online Worksheet, you will begin to construct an instructionally designed learning artifact. The first step in this process is creating a PowerPoint storyboard of your lesson using an appropriate instructional design model from our class readings. Your script should not be longer than 2-3 pages of written text, and your storyboard should include the visuals that you will use to construct a movie in Part 2. Now that you have a storyboard, you will use a video composition tool such as iMovie or Camtasia to bring your lesson to life. As a minimum requirement, you will need to record yourself reading your script, and time your vocals to appropriate visuals. With your video in hand, you will now create a Weebly website using the provided website template. In addition to any customizations, you will need to include your video, as well as 3 other resources text-audio-visual resources from the Internet. Present your website to the class for critique. You will be graded on 1) identifying the website's audience, 2) articulating the purpose of your lesson for the audience, and 3) the relevance of your resources to your audience. Participation in classroom discussions, group work, forums, readings, and presentations are important parts of your learning experience. Please come to class having read the assigned texts, and be ready to discuss some of the deeper ideas with other students. Reiser, R. A. (2000). 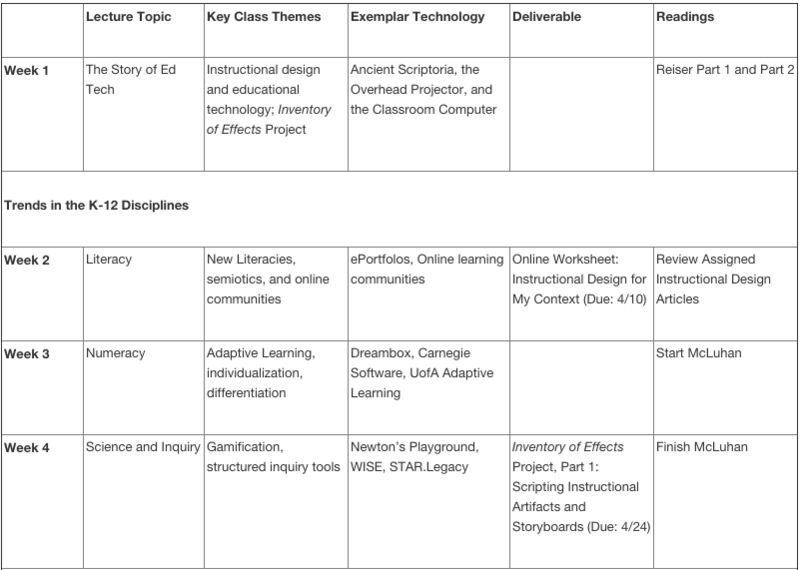 A History of Instructional Design and Technology: Part II: A History of Instructional Design. Educational Technology Research and Development, 49, 57–67. Schwartz, D. L., Brophy, S., Lin, X., & Bransford, J. D. (1999). Software for managing complex learning: Examples from an educational psychology course. 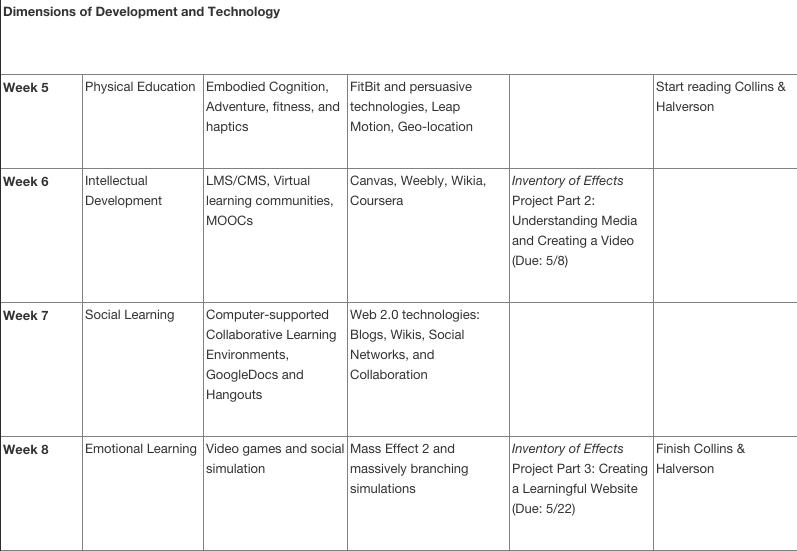 Educational Technology Research and Development, 47(2), 39–59.